Click here to sign up for the CTLJ Newsletter. In 2001, a group of students, under the guidance of Professor Phil Weiser, founded the Colorado Technology Law Journal, formerly the Journal on Telecommunications and High Technology Law, at the University of Colorado Law School. 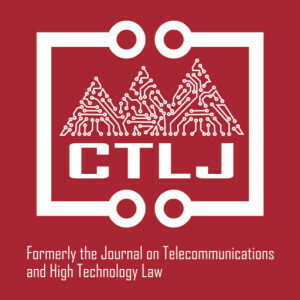 The Colorado Technology Law Journal has since established a position among the elite national technology and telecommunications law journals, featuring seminal moments in Internet policy such as former FCC Chairman Michael Powell’s articulation of the four Internet Freedoms and Professor Tim Wu’s groundbreaking definition of Network Neutrality. The Colorado Technology Law Journal is closely affiliated with the Silicon Flatirons Center at the University of Colorado at Boulder. Annually, the Center hosts the nationally renowned Digital Broadband Migration symposium, submissions to which are published in the fall/winter issue of the Colorado Technology Law Journal. The Silicon Flatirons Center for Law, Technology, and Entrepreneurship is an interdisciplinary research center at the University of Colorado Law School. Silicon Flatirons’ core mission is to elevate the debate surrounding technology policy issues; support and enable entrepreneurship in the technology community; and inspire, prepare, and place students in these important areas. The Colorado Technology Law Journal invites manuscripts/papers throughout the year. The reviewing cycle continues until publication spaces are filled. Please submit to the Managing Editor at ctlj@colorado.edu. Authors may also submit articles using BePress/ExpressO.